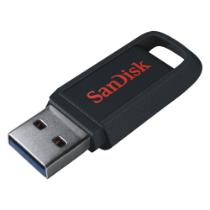 Defy the elements with the SanDisk® Ultra Trek™ drive’s tough shock-, water-, dust- and scratch-resistant shell outside2, and SanDisk SecureAccess® encryption and password protection inside. This ruggedized USB 3.0 flash drive withstands drops of up to 16.4 feet (five meters)1 and reaches speeds of up to 130MB/s**. The ruggedized outer case provides a tough shock-, dust- and scratch-resistant layer2, and withstands drops of up to 16.4 feet (five meters)1. The water-resistant exterior shell helps your content survive harsh environments2. Inside, it includes SanDisk SecureAccess® encryption and password protection software to help keep your content safe4. The Ultra Trek USB Flash Drive resists extreme temperatures from 32° F-212° F (0˚ C - 100˚ C)3. All available capacities, 32GB-128GB*, offer a five-year warranty. **Read speeds up to 130MB/s. Write speeds lower. USB 3.0 port required. Based on internal testing; performance may be lower depending upon host device. 1MB = 1,000,000 bytes. 2Shock-, water-, dust- and scratch-resistant, and was tested under controlled laboratory conditions with a rating of IP55 under IEC standard 60529; product must be clean and dry before use. 4Password protection uses 128-bit AES encryption (software download required for Mac; see www.SanDisk.com/SecureAccess).